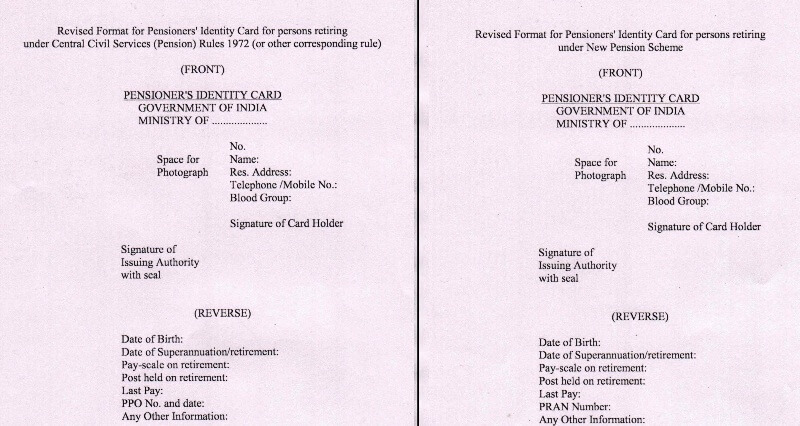 Sub: Issue of Pensioners' Identity Card to Pensioners- Revised Format. The undersigned is directed to refer to this Department's OM of even no. dated 12.08.2015 and to say that the instructions related to the issue of Pensioners' Identity Card to Pensioners were issued by this Department. In para 2 of the OM dated 12.08.2015, it is mentioned that Pensioners' ID Card shall include the Aadhaar No. of the pensioners, if available. Accordingly, a format for the pensioners' Identity Card was also issued. 2. The matter has been reconsidered. It has been decided that henceforth, the Pensioners' Identity Card may be issued to the pensioners in the revised format (copy enclosed).